When 22 members of the BrainNet Europe (BNE) consortium assessed 31 cases with α-synuclein (αS) immunoreactive (IR) pathology applying the consensus protocol described by McKeith and colleagues in 2005, the inter-observer agreement was 80%, being lowest in the limbic category (73%). When applying the staging protocol described by Braak and colleagues in 2003, agreement was only 65%, and in some cases as low as 36%. When modifications of these strategies, i.e., McKeith’s protocol by Leverenz and colleagues from 2009, Braak’s staging by Müller and colleagues from 2005 were applied then the agreement increased to 78 and 82%, respectively. In both of these modifications, a reduced number of anatomical regions/blocks are assessed and still in a substantial number of cases, the inter-observer agreement differed significantly. Over 80% agreement in both typing and staging of αS pathology could be achieved when applying a new protocol, jointly designed by the BNE consortium. The BNE-protocol assessing αS-IR lesions in nine blocks offered advantages over the previous modified protocols because the agreement between the 22 observers was over 80% in most cases. Furthermore, in the BNE-protocol, the αS pathology is assessed as being present or absent and thus the quality of staining and the assessment of the severity of αS-IR pathology do not alter the inter-observer agreement, contrary to other assessment strategies. To reach these high agreement rates an entity of amygdala-predominant category was incorporated. In conclusion, here we report a protocol for assessing αS pathology that can achieve a high inter-observer agreement for both the assignment to brainstem, limbic, neocortical and amygdala-predominant categories of synucleinopathy and the Braak stages. I. Alafuzoff, P. Ince, J. Bell, J. Ironside, S. Gentleman, H. Kretzschmar did primary assessment of all cases; I. Alafuzoff, P. Ince the construction of the assessment recommendations. Each listed author carried out the assessment and contributed to manuscript revision. While evaluating postmortem brains for signs of neurodegeneration, the pathologist has to assess numerous pathologies, both those that one might expect to find based on the clinical presentation and those that might be found based on frequent findings of comorbidity. Furthermore, one must also consider the high rate of unexpected pathologies that characterise the ageing brain. Operationalized criteria have been developed in order to make the assessment of pathology more reliable and reproducible. These criteria have, however, rarely been validated even for some of the pathologies that are both common and carry a clinical significance [1, 18, 21]. The major prerequisites for recommendable operationalized criteria are clarity, reproducibility and validation. Already in 1984, Kosaka and colleagues  made the first attempt to standardize the assessment of brain pathology associated with dementia with Lewy bodies (DLB). DLB cases were divided into brainstem, limbic and neocortical subtypes. This division formed the basis of the clinical concept that in Lewy body disorders (LBD) the clinical manifestation depends on the anatomical distribution of the pathology [11, 13, 17, 19, 25]. More detailed instructions for diagnostic procedures when dealing with DLB, including details for sampling of brain, staining of sections, assessment and diagnostic rating of lesions were published in 1996 by the Consortium on DLB International Workshop . These consensus recommendations were based on work carried out assessing either hematoxylin–eosin stained sections or applying ubiquitin immunohistochemistry (IHC). 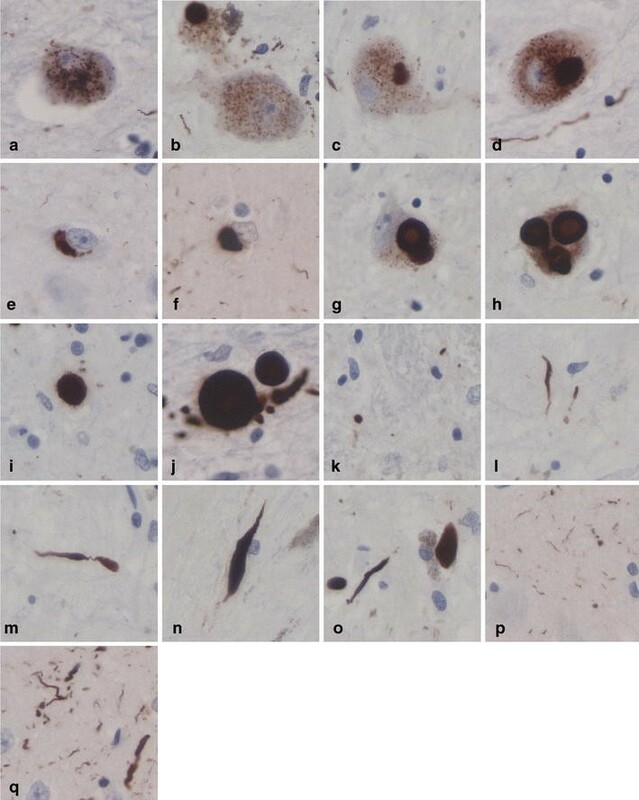 In 1993, Ueda and colleagues identified a protein they referred to as the non-Aβ component of Alzheimer’s amyloid, and later in 1997 Polymeropoulos and colleagues demonstrated that this protein, α-synuclein (αS), was central to the neurodegenerative process in DLB and Parkinson’s disease [26, 30]. The era of αS IHC was subsequently initiated by the report that LBs and LB associated neurites (LN) were consistently labelled with αS across this spectrum of disorders . In 2003, Braak and colleagues, following the concept delineated by Kosaka and colleagues and applying αS IHC, described a staging hierarchy of LB related pathology [5, 17] (Table 1a). These authors emphasised that αS immunoreactive (IR) pathology initially occurs in the dorsal motor nucleus of vagus and then progresses in an orderly caudal to rostral direction, ultimately reaching the neocortex. Subsequently in 2005, the DLB consortium revised their original protocol and recommended αS IHC as the preferred method of pathological evaluation, added new brain regions and devised a detailed scoring strategy for the assessment of the labelled lesions [19, 20] (Table 1c). Since then, several studies have been published using αS IHC in combination with the two most commonly used classification strategies usually referred to as Braak’s staging and McKeith’s typing of LB disease related pathology [5, 20]. When assessing a large number of brains, many of these studies indicate that αS pathology is not always present as would be predicted according to the hypothesis of anatomical hierarchy that underpins these protocols. Thus, some cases remain unclassifiable (17–51%) if one strictly follows these current assessment recommendations [13, 18, 22, 23, 31]. Interestingly, in 2008, Leverenz and colleagues reported that they were able to increase the number of classifiable cases from 51 to 96% by modifying the classification strategy originally described by McKeith and colleagues (Table 1d) [18, 20]. The modifications consisted of a reduction in the number of regions to be examined, more variability in the assessment of the severity of LB-related pathology and the addition of an amygdala-predominant category of synucleinopathy. Only a few reports have been published assessing the reproducibility of the recommended staging strategies. The first report regarding inter-rater agreement showed that high agreement was reached when six observers rated five brain regions in 21 cases following a somewhat simplified version of the original strategy proposed by Braak and colleagues [5, 21] (Table 1b). Later in 2008, two neuropathologists reached a 58% agreement assessing 89 cases with LB-related pathology. Each case was represented by 9 brain regions and was classified according to the original McKeith protocol [18, 20] (Table 1c). The level of agreement between these two assessors increased to 83% when the proposed modified McKeith typing strategy was applied  (Table 1d). The objectives of this study were to assess inter-rater agreement among 22 neuropathologists with two strategies, the original staging strategy of Braak and colleagues and the original typing protocol of McKeith and colleagues [5, 20]. The study sought to identify the pitfalls that impact on the inter-observer agreement to produce a staging strategy yielding the highest possible agreement in an inter-laboratory setting combining many participants with varying experiences of assessing the pathology of DLB. Furthermore, we evaluated the reproducibility of both the simplified Braak’s staging previously utilized in the inter-rater trial by Müller and colleagues and the recently launched modification of the McKeith’s typing strategy proposed by Leverenz and colleagues [18, 21]. Finally, we applied the new modified protocols designed within BrainNet Europe (BNE) to assimilate the strength of Braak’s and McKeith’s strategies with other recent advances in αS pathology. The general working order is summarized in Fig. 1. Thirty-one cases were included and the sampling of the blocks was carried out by one neuropathologist. The selection of the anatomical regions included in this study was based on the currently commonly used assessment strategies, i.e. Braak’s staging and McKeith’s typing of LB disease related pathology [5, 20]. Furthermore, only neuroanatomical regions that are known to be easily recognizable even by an observer lacking substantial training in neuroanatomy were included  (Fig. 2). The cases included were selected based on that they displayed αS-IR lesions in various extent. Thus, cases with all stages from mild to severe involvement with αS-IR lesions were available for assessment. 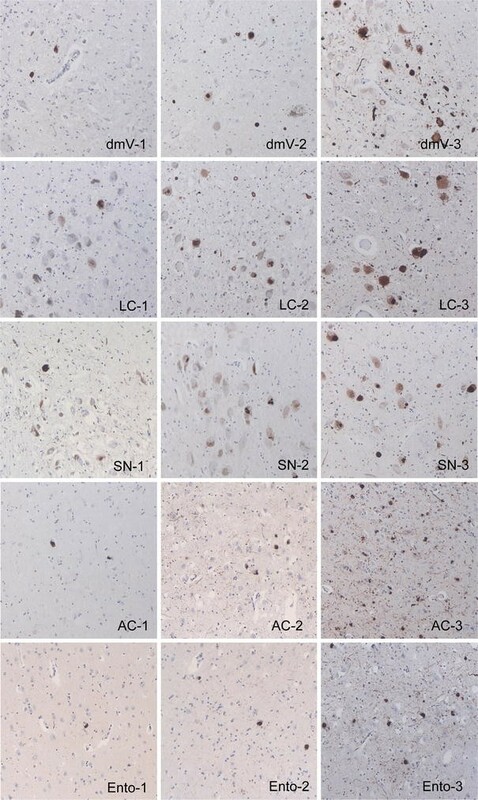 A total of five sets of 7-μm-thick sections were produced from 10 brain areas of the 31 cases. The demographics of the included material are shown in Table 2. Five sets of the ten sampled sections were manually stained by applying IHC methodology. In brief, after rehydration, the sections were autoclaved in citrate buffer and pre-treated with 80% formic acid for 5 min. Subsequently, the sections were incubated overnight at 4°C with a monoclonal primary antibody directed against αS (Novocastra/NCL-ASYN, clone KM51, dilution 1:1,000). The reaction product was visualized using the Zymed Lab-SA detection system (Zymed, San Fransisco, CA, USA) with the use of Biosource Romulin AEC as the chromogen (Biocare Medical, Walnut Creek, CA, USA). The members of the reference group (I.A., P.I., H.K., J.I., J.B., S.G.) simultaneously assessed all the cases using a multi-headed microscope (Table 2). The reference group assigned each case to Braak’s stage and McKeith’s type according to the original publications from 2003 and 2005 [5, 20]. In addition, the regularity of the caudal to rostral distribution of pathology was assessed and discrepant cases were identified as atypical (Table 2). When a prominent involvement of the amygdala was seen (e.g. amygdaloid αS pathology present in excess compared to brainstem involvement), the case was classified as being of amygdala-predominant type. Assessment instructions were written by two members of the reference group (I.A., P.I.). The instructions included a detailed description of the samples (Fig. 2), photographs of the pathology to be assessed (Figs. 3, 4), general instructions regarding assessment (Table 3) and detailed tabulated guidelines on the staging and typing (Table 1). Participants were encouraged to read the original publications. Twenty-two participants assessed and staged each case as instructed. The results were recorded on the assessment sheets (Table 4) which were collected in the coordinating centre where the data were integrated for analysis. These assessment sheets included information on whether or not the participant had identified the target neuroanatomical regions, whether or not αS pathology was seen, an assessment of LBs and LNs and the designated stage and type of each case. In addition, each participant stated whether the distribution of pathology seemed to progress as expected (i.e. typical vs. atypical case) and whether amygdala-predominant synucleinopathy was observed. Following the phase of individual assessment, the group convened a meeting to jointly assess all IHC labelled sections around a multi-headed microscope. The diagnostic features of each stage were discussed. While assessing the stained sections under the multi-headed microscope, the actual observations were compared with the data recorded in the assessment sheets. Inconsistencies in these observations were discussed and pitfalls were sought. Detailed data found in the original assessment sheets were re-examined and a Braak stage and McKeith type was assigned following a new modification of original protocols designed by the members of BNE during the consensus meeting. In addition, the data in the original assessments sheets were used to assign a Braak stage as described by Müller and colleagues in 2005 (Table 1b) and a McKeith type as described by Leverenz and colleagues in 2008 (Table 1d) [18, 21]. Regarding the assignment of Braak stage as described by Müller and colleagues, in the place of the mesocortical transentorhinal cortex the mesocortical temporo-occipital cortex was included since this region is affected to an equivalent extent. The above adjustments did not require re-assessment of slides as all of the required data was readily available in the original assessment sheets. The statistical analyses were conducted with SPSS 16 for Windows. The agreement in the assessments was estimated applying the nonparametric Wilcoxon rank-sum test. In addition, the value of absolute agreement (%) was calculated, that is, the proportion of equal assessments. Digital images were taken using a Leica DM4000 B microscope equipped with a Leica DFC 320 digital camera. The results from the individual assessments (i.e. prior to the consensus meeting) are summarized in Tables 5 and 6. All assessors detected αS pathology in all cases and the agreement of the Braak stage ranged from 32 to 100% (Table 5) significantly differing in 24 out of 31 cases. All the assessors were in agreement on the assigned stage in only 4 out of 31 cases (all cases with Braak stage 6). In 30 out of 31 cases, most of the assessors agreed with the reference group (except #9). The overall agreement was 65% and agreement was highest in stages 1 (95%) and 6 (79%). In 27% of assessments (24 cases), a lower and in 24% (17 cases) a higher stage was given when compared to the reference assessment. There was only a 55% agreement between the assessments when only the twelve cases that were considered by the reference group as being atypical in their caudal to rostral distribution of αS pathology or those assessed to be of the amygdala-predominant type were included. Agreement increased to 70% only when the 19 cases with a typical distribution of pathology were included. Out of these 19 assessments, 12 differed significantly (P < 0.05). Agreement between assessments of McKeith type synucleinopathy ranged from 45 to 100% significantly differing in 11 out of 31 cases (Table 6). All participants agreed that a case corresponded to the same McKeith type in only five cases. However, in all cases, the majority of assessors agreed with the reference group. The overall agreement was 80%, being highest in brainstem type (86%) followed by neocortical type (82%). Nine out of 31 cases (29%) were assigned by some assessors as being of brainstem, by others they were believed to be limbic and by yet others as being of neocortical type. There was 73% agreement between the assessments when the six cases considered to be of the amygdala-predominant type were included and the agreement increased from 73 to 83%, if only the 25 remaining cases were included. Out of these 25 assessments, 8 differed significantly (P < 0.05). There was extensive variation in the agreement regarding assessment of typical versus atypical caudal to rostral propagation. Following the strategy delineated by Braak and colleagues, most of the individual assessments agreed with the reference group in six out of the nine atypical cases (# 11,12,17,18, 23, 24). Overall agreement about typical versus atypical distribution of pathology exceeded 75% in only 12 out of 31 cases. In only 11 cases did all assessors agree that the αS pathology displayed a typical distribution pattern. According to the reference group, six cases displayed an amygdala-predominant αS pathology. The majority of the individual assessments were in agreement in five of these cases (# 14, 17, 18, 22 and 23). In all six cases, all individual assessments noted the substantial αS pathology in amygdala. In one other case (#20) in contrast to the reference group, some observers had also observed substantial pathology in the brainstem (Table 7). In all of the remaining cases with pathology in the amygdala, the severity of αS pathology was proportionate to that seen in the midbrain/brainstem. Nevertheless, 12 of these cases were considered by some observers to be of the amygdala-predominant type. Most of the assessors participated in the consensus meeting where there was a joint assessment of all cases. Issues such as whether or not a case fulfilled the staging requirements (i.e. typical vs. atypical case or whether or not a case should be labelled as an amygdala-predominant type) were debated. It became evident that the primary obstacle was not in microscopic assessment but rather in the assignment of the Braak stage and the McKeith type [5, 20]. With respect to the Braak stage, problems were encountered when all regions were not affected with αS pathology. The major obstacle in the assignment of McKeith type was the overlap of αS-IR pathology between the subtypes. This arose from the lack of clarity in the difference between brainstem and the limbic categories or limbic and neocortical categories. After these discussions, a new modification of the original assessment protocols referred to as the ‘BNE protocol’ was formulated to increase the agreement between the assessments (Fig. 5). The issue of a threshold level of αS pathology was widely debated, e.g. does a single LN in an anatomical region indicate that the region is involved and taken into consideration in the modified protocol (Fig. 5). In the newly designed BNE protocol, 13 anatomical regions repeatedly identified and found in 9 sampled blocks were included. Thus, each Braak stage and each McKeith type were represented by at least two neuroanatomical regions to ensure better reproducibility in the assessment results. Furthermore, the lesions requested to be seen in the region of interest were defined as being LBs or LNs or both. No counting of IR lesions was required and only in the case of the amygdala-predominant category was an arbitrary assessment of the extent of pathology required (Fig. 5). Table 8 summarises the assessment results and the rate of inter-observer agreement while following the BNE protocol compared to the earlier modifications of the Braak’s staging and McKeith’s typing of αS pathology [18, 21]. While following the BNE-protocol, the Braak stage differed in four cases when compared to the original reference assessment (case 5 Braak stage 3 → 4; case 9, 12 and 14 Braak stage 4 → 5/6). The original McKeith type was altered in 13 cases (cases 5, 7–13 McKeith brainstem → limbic; cases16, 21, 23 and 24 McKeith limbic → neocortical). Using the BNE-protocol, the overall agreement regarding the Braak stage increased from 65 to 83% and with respect to the McKeith type from 81 to 84%. It is noteworthy that while applying the BNE protocols for Braak staging and McKeith typing, the number of cases with significantly differing (P < 0.05) assessments dropped from 17 to 10 and from 12 to 10 cases, respectively. Rather similar agreement was obtained when applying the strategy proposed by Müller and colleagues , assessing αS in fewer brain regions. It is noteworthy, however, that the original assessment results were altered in as many as 12 cases and some of these alterations were substantial (case 17 stage 5 → 3 and case 21 stage 6 → 3). The strategy proposed by Leverenz and colleagues  (i.e. assessing fewer brain regions and taking into account also the amygdala-predominant type) largely followed the pattern obtained when applying the BNE protocol. There was one significant difference when comparing the BNE protocol with the previous modifications of the widely accepted categorization strategies. If one utilized the newly designed BNE protocol, then the inter-observer agreement was 70% or more in most cases (Table 8). The assessment differed significantly (P < 0.05) in 14 out of 31 cases when applying the strategy proposed by Leverenz, when compared with 10 cases when following the protocol designed by BNE. In the original assessment, six cases (# 11,12,17,18, 23, 24) were considered by most assessors to be atypical with respect to the caudal to rostral propagation of pathology. The data recorded in the assessment sheets showed that five cases (# 4, 17,18, 23, 24) did not fulfil the anatomical sequence of Braak’s staging in most assessments and these cases were thus designated as “staging criteria incompletely fulfilled” as recommended by the BNE protocol. Remarkably good agreement, over 80%, was achieved in this study when 22 observers assessed 31 cases with αS pathology. It is noteworthy that this high rate of agreement required modification of both of the widely adopted current protocols [5, 20]. When designing the tabulated guideline utilized by the 22 observers in this trial, it was clearly noted that the platform for the assessment of αS pathology is essentially the same when assigning a Braak stage or a McKeith type [5, 20]. Both strategies are based on the original work of Kosaka and colleagues  and assume that αS pathology progresses in an orderly caudal to rostral direction. The main difference between these two commonly applied protocols is primarily in the selection of the regions to be assessed. In Braak’s staging, the outcome is given as a stage of αS pathology and in McKeith’s typing a more generalized ‘type’ or anatomical category of αS pathology is assigned [5, 20]. The ‘brainstem type’ of the McKeith’s strategy largely corresponds to Braak stages 1–3, and the ‘neocortical type’ largely to Braak stages 5 and 6. However, the ‘limbic type’ of the McKeith strategy can represent Braak stages 3–5, if the assessment instructions are strictly followed [5, 20]. There is much recent work confirming that the progression of αS pathology is not as straightforward as originally presumed and there are several reports which highlight deviations in the orderly caudal to rostral progression pattern of pathology [11, 12, 16, 18, 22, 23, 29, 31]. One likely reason why the Braak’s original staging may yield poor inter-observer agreement is that the staging scheme requires that each subgroup displays newly affected regions and worsening impairment of those previously involved [5, 6]. With respects to the McKeith’s typing, lack of clear differences between the three categories represents a major obstacle . Thus, when strictly following the published instructions, a substantial number of cases remain unclassified, clearly indicating the need for a more universally applicable paradigm of αS pathology [16, 18, 22, 23, 31]. In this study, applying the original McKeith’s typing resulted in an overall inter-observer agreement of 81% which was lowest in the limbic type (73%) . It should be noted, however, that in 39% of the cases, less than 75% of the observers agreed on the specific type. Two observers used the McKeith’s typing to assess 89 cases and achieved an even lower agreement (58%), and concluded that a substantial number of their original 208 cases (49%) were not classifiable . However, they reported that by reducing the number of regions to be assessed, by adding an amygdala-predominant entity and by allowing more variability in the assessment of the severity of LB-related αS pathology, they were able to categorise 97% of their cases [18, 20]. They reported 87% agreement between the two assessors when following their modified criteria. The existence of the amygdala-predominant category was already acknowledged by Uchikado and colleagues in 2006 . The 22 observers in the present study reached an 82% agreement when applying those modified criteria , a performance which was also achieved for the protocol newly designed by the BNE consortium (84%) during the joint assessment meeting. Both the modified McKeith’s typing  and the BNE protocol resulted in assignment of each case to the same category (i.e. brainstem, limbic or neocortical). The absolute agreement while applying the Leverenz strategy and the BNE protocol is here probably primarily due to the selection of material . It should be noted that these two strategies are not fully comparable. In all included cases which were of neocortical type, substantial pathology was seen and thus the Leverenz criteria, i.e. >1 LB/high power field and sparse neurites were fulfilled. The BNE-protocol does not require any assessment of the extent of pathology and thus some cases which are designated being of neocortical type following BNE-protocol (αS-IR LBs seen) will fulfill the criteria for limbic type rather than neocortical while following the strategy described by Leverenz and colleagues . It is noteworthy that the protocol designed by BNE resulted in only six cases where agreement was below 70% compared to ten cases following the recently modified McKeith’s strategy . It is noteworthy that αS pathology in a neuroanatomical region not included in the Leverenz modification but recommended for assessment in the BNE protocol may alter the result in specific cases . Related issues around the variability of pathology within individual cases is therefore an important source of discrepancy, when comparing results obtained by different observers who may have followed different modifications of published assessment strategies. Furthermore, the clinical and pathophysiological significance of αS pathology seen in various anatomic patterns is still unclear, as was recently stated in a critical reappraisal of Lewy related pathologies by Jellinger . Based on the above, a reduction of regions to be assessed regarding αS pathology is not advisable. When the results obtained when following the original instructions published by McKeith and colleagues were compared to those obtained while following either the Leverenz modification or the BNE-protocol, it was noted that 12 cases were allocated to a more ‘rostral’ category (8 cases, brainstem → limbic; 4 cases, limbic → neocortical) [18, 20]. These category shifts might be due to the lack of detail in the original published criteria. Leverenz and colleagues already noted that one of the pitfalls in the original publication was a lack of stringency, so that they recommended assigning a case that fulfilled criteria for two categories to the more anatomically rostral category. In contrast, the BNE-protocol permits cases to be assigned to only one category to avoid this confusion. The clinical implications of this shift to a more “rostral” neuropathological category need to be evaluated as both limbic and particularly neocortical types are considered to be evidence of a more severe symptomatology. When the original Braak protocol was applied, then only a 65% agreement was reached in the staging of αS pathology with the agreement being as low as 32% in some cases. Only in cases in stages 1 or 6 was agreement high. Two issues influenced this outcome. The variability within each stage was extensive in those cases where the pathology lay outside the hypothetical pattern of caudal to rostral progression and also in cases with amygdala-predominant pathology. Taking these two issues into account, the agreement increased only from 65 to 67%. When stages 5 and 6 were combined as in Table 8, the percentages were still below 80% (74 respective 77). Previously, it was reported that a high agreement could be reached following a slightly modified Braak protocol when staging αS pathology in 21 cases by 6 observers . We also applied the strategy described by Müller and colleagues and achieved 78% agreement in the assessments and the agreement increased to 79% when the six cases of amygdala-predominant synucleinopathy were excluded. However, in our study, the results obtained while applying the strategy described by Müller and colleagues differed significantly from those obtained when applying the original strategy described by Braak and colleagues and those obtained when applying the BNE-protocol. In a substantial number of cases, the Müller modification resulted in assignment to a lower stage [5, 21]. This difference is primarily due to the reduced number of neuroanatomical regions assessed by Müller and colleagues compared to the original Braak protocol [5, 21]. Furthermore, on an individual case level, the inter-observer agreement differed significantly in 14 cases when compared to 10 cases when applying the BNE protocol. 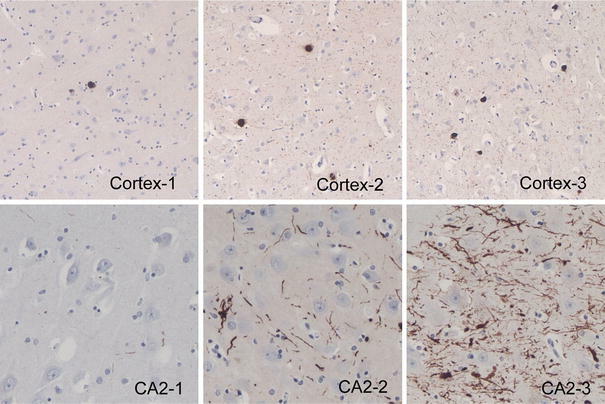 Already in 2006, Uchikado and colleagues  noted while assessing LB pathology in subjects with Alzheimer’s disease that in some cases an amygdala predominant distribution of αS pathology was noted. Later, in 2008 Leverenz and colleagues  proposed the addition of an amygdala predominant category to permit a reliable classification. Here, we also noted that the addition of an amygdala-predominant category increased the inter-observer agreement. Using the nine-block strategy (Fig. 5) proposed by the BNE protocol, not only is it possible to robustly assign the αS pathology type, but also a more detailed stage of αS pathology can be ascribed. Thus, this method is applicable both to diagnostic and research use. For molecular-biological, biochemical or detailed clinico-pathological studies, we recommend that the αS stages from 0 to 6 and the assignment to a amygdala-predominant category will be most appropriate, whereas for routine diagnostic purposes a more generalized assignment to brainstem, limbic, neocortical or amygdala-predominant categories may be sufficient. The sampling strategy recommended by BNE and recommended in the original strategies described by Braak and colleagues  and McKeith  and colleagues do not include the olfactory bulb that has been indicated to be affected at an early stage in both Alzheimer’s disease  and of PD and DLB . 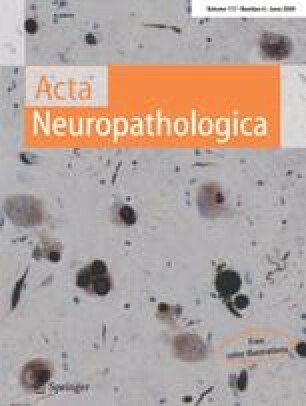 It is, however, relevant to consider whether this structure, contrary to current general practise in diagnostic neuropathology, should be routinely sampled for assessment of neurodegenerative lesions, particularly when dealing with unimpaired aged subjects. Recently, the significance of αS pathology in the olfactory bulb in subjects with DLB was brought forward by Beach and colleagues . The sensitivity and specificity of αS pathology in the olfactory bulb for PD and DLB were over 90% and thus the authors concluded that αS pathology accurately predicted the presence of αS pathology in other brain regions . They even suggested that olfactory bulb biopsy should be considered as a diagnostic tool particularly in subjects being assesses for surgical therapy. This approach was further discussed by others as some negative biopsy studies regarding αS pathology in the olfactory bulb have also been reported [15, 24]. Recently, Sengoku and colleagues  assessed 320 consecutive autopsies which showed αS pathology in 32.9%. However, the olfactory bulb was involved in only 26.6% further emphasising that involvement of the olfactory bulb is not seen in all cases with αS pathology in the central nervous system. The novel BNE-protocol for designation of both the stage and the type of αS pathology is based on the assessment of αS-IR in 13 defined neuroanatomical regions in conjunction with the type of lesions (i.e. LB or LN). This strategy was devised to avoid one major problem in the validation of inter-observer methods for evaluating neurodegenerative pathology, i.e. the use of numerical counting of lesions. Previous studies dealing with the assessment of αS pathology have indicated that it is difficult to achieve satisfactory agreement on the severity of pathology in even a core sample of only 2 mm diameter . It was concluded that since quantitative estimates of αS-IR structures are unreliable, these should not be included in the assessment strategy. It is also evident that differing staining methods for αS pathology yield variable results [2, 3, 8]. Thus, a standard validated protocol for typing and staging pathology does require a consistent quality in the stained sections and an assessment method that delivers reproducible results. In conclusion, here we report a protocol for assessing αS pathology, based on a modification of the existing widely adopted methods that can achieve a high inter-observer agreement for both the assignment to brainstem, limbic, neocortical and amygdala-predominant categories of synucleinopathy and the Braak stages (1–6) when appropriate. Due to its simplicity, when these BNE-protocols were applied, it was possible for all cases to be classified, i.e. by evaluating nine brain regions and only assessing the presence or absence of αS-IR LBs and LNs. We thank Mrs. Tarja Kauppinen, Mrs. Merja Fali, Mr. Heikki Luukkonen and Mr Hannu Tiainen for technical assistance and Ewen MacDonald for critical reading of the manuscript. This study was supported by European Union grant FP6: BNEII No LSHM-CT-2004-503039. This article reflects only the authors’ views and the Community is not liable for any use that may be made of the information contained therein. The study has been authorized by the Ethics Committee of Kuopio University Hospital.